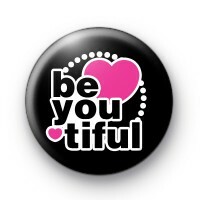 This is a black, pink and white 25mm pin button badge with the words Be You tiful in fun bold writing with a pink heart. SO it reads Beyoutiful & is a play on words (beautiful) with a romantic meaning. Ideal for giving to someone special this Valentine's Day.